A 10-year-old spinner at Rhodes Mfg. Co., in Lincolnton, N.C., 1908. Lewis Wickes Hine considered himself as much a detective as a photographer. 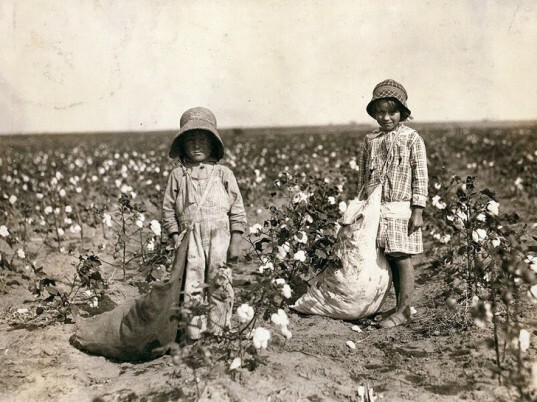 Hired in 1908 by the nascent National Child Labor Committee, first on a temporary and then on a permanent basis, the former schoolteacher from Wisconsin was given the task of investigating—and documenting—the working conditions many young children faced in early 20th century America. 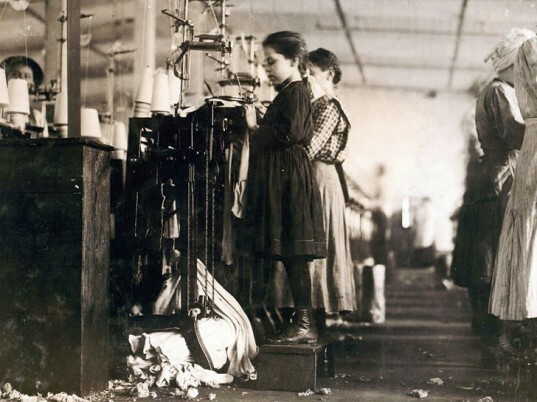 Although several states and territories had, by the 1800s, passed child-labor laws, they were for the most part were weak and infrequently enforced. 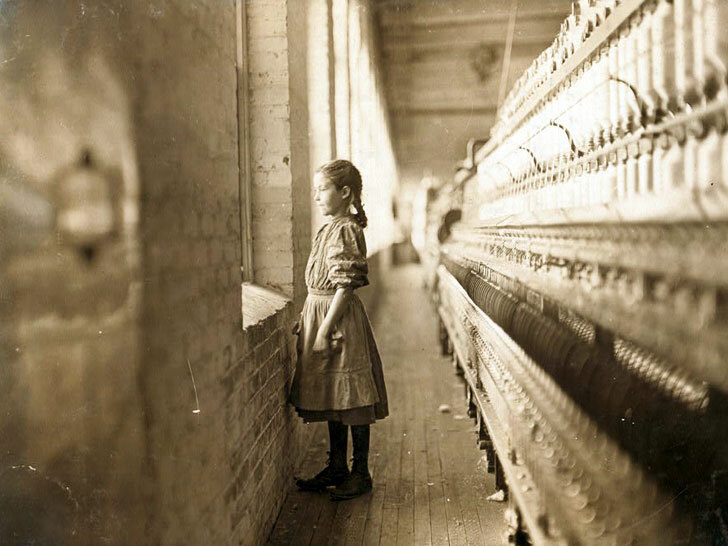 Hine's photographs of boys and girls toiling in textile mills, coal mines, cotton fields, and glass factories, as "'newsies,' seafood workers, fruit pickers, and salesmen" revealed a shocking reality that mobilized public opinion and galvanized efforts to create a national standard for regulating child labor. “Jewel and Harold Walker, 6 and 5 years old, pick 20 to 25 pounds of cotton a day” in Comanche County, Okla., 1916. For nearly two decades, Hine traveled the country with with a 5-by-7-inch box camera, outdated even by 1904 standards, an old-fashioned bulb shutter, glass-plate negatives, and magnesium flash powder for illumination. Hine courted suspicion from business owners, supervisors, and workers wherever he went, at times risking real, physical danger. Hine courted suspicion from business owners, supervisors, and workers wherever he went, at times risking real, physical danger in places where he wasn’t welcome. He often had to “bluff” his way to gain access to his subjects. “This little girl like many others in this state is so small she has to stand on a box to reach her [knitting] machine” in Loudon, Tenn., 1910. By the end of his tenure, Hine had amassed more than 5,000 prints, each one meticulously captioned. More than a record of existing conditions, Hine’s photos were a “powerful weapon in the crusade against child labor,” one that eventually led President Franklin Delano Roosevelt to sign the Fair Labor Standards Act in 1938, which set set minimum-wage and maximum-hour standards, along with limitations on underage labor. "Jennie Rizzandi, 9-year-old girl, helping mother and father finish garments in a dilapidated tenement" in New York City, 1913. "Charlie Foster has a steady job in the Merrimack Mills. School Record says he is now 10 years old. His father told me that he could not read, and still he is putting him into the mill," Huntsville, Ala., 1913. The "Kinleygarten" at Lynchburg Cotton Mills in Virginia. "The children of the mill settlement, from 6 to 8 years attend," Hine wrote. "Several older boys were hanging around and joining in when they could. Also a mother and babe. I asked Miss Carrington, in charge, where the children from eight to fourteen go, and she said that few of them at those ages care for education. They are just waiting to become old enough to get into the mill. The only available school for them is a long way," 1911. "Jewel and Harold Walker, 6 and 5 years old, pick 20 to 25 pounds of cotton a day" in Comanche County, Okla., 1916. "This little girl like many others in this state is so small she has to stand on a box to reach her [knitting] machine" in Loudon, Tenn., 1910. A young spinner at Mollahan Mills in Newberry, S.C., who was "tending her 'sides' like a veteran...The overseer said apologetically, 'She just happened in.' She was working steadily. The mills seem full of youngsters who 'just happened in' or 'are helping sister,'" 1908.